And now, back to polish! Indie brand Pahlish has been mixing up small batches of what she calls "soft launch prototype" polishes. The first of these was Bitter Sweet Symphony. 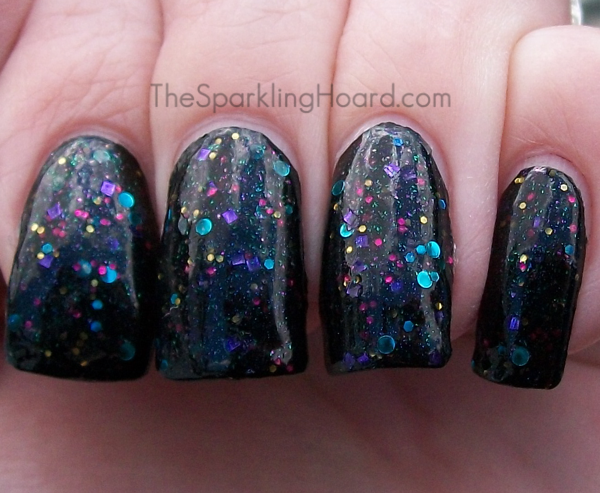 Bitter Sweet Symphony features a black jelly base filled with metallic blue circle glitter, metallic purple square glitter, metallic red hex glitter, metallic yellow hex glitter, holographic blue hex glitter, and green and purple microshimmer. I found the formula to be quite thick, so I'll probably add some nail polish thinner before I use it again. Dry time was average. You could probably reach full opacity in about three coats, but I chose to layer two coats of Bitter Sweet Symphony over one coat of Cult Nails Nevermore. 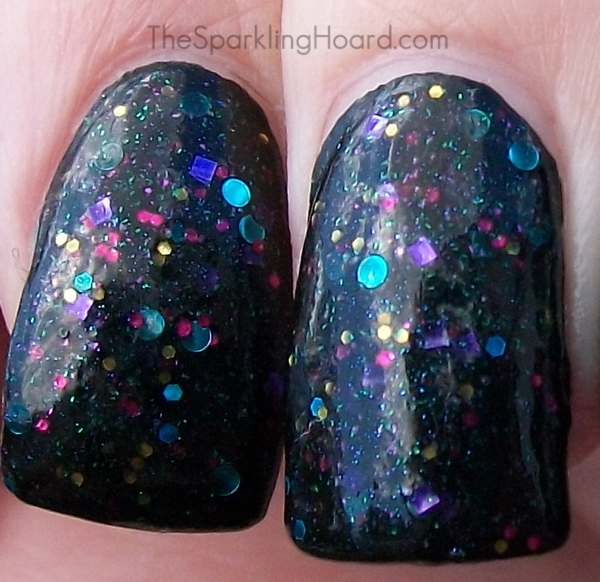 I'm such a sucker for the whole sample/prototype concept, and this polish is one of my favorite things to come out of this trend among the indie sellers! What about you guys? Have you been been enchanted by the whole sample/prototype thing? Pahlish's soft launch prototypes cost $9 for 15mL and are sold in Pahlish's Etsy shop. Bitter Sweet Symphony is still available at the moment, but it may not be around forever, so if you like it, you might want to buy it now! To stay up-to-date on the newest soft launch prototypes, Like Pahlish's Facebook page.